Post-Brexit, the third-largest theater chain in the U.S. is making a bold push into the U.K. and Europe. Here are the details. AMC Entertainment Holdings (NYSE:AMC) made a big statement this week: it will buy out someone in the movie-theater business, one way or another. After proposing a merger with Carmike Cinemas (NASDAQ:CKEC) back in March, AMC today announced an agreement to purchase Europe's largest theater chain, Odeon & UCI Cinemas Group. Here is what investors need to know. AMC entered a definitive agreement to purchase London-based cinema chain Odeon & UCI from private equity firm Terra Firma. If the deal goes through, the purchase will be valued at about $1.2 billion. Terra Firma will receive 75% in cash and 25% in stock, and AMC will assume 407 million pounds in debt from Odeon & UCI. The European theater chain will continue to operate as an AMC subsidiary under the Odeon & UCI name. AMC would add the 242 locations and 2,236 screens in the seven European countries that Odeon & UCI operates in. This would combine with AMC's third largest U.S.-based theater chain for a total of 627 theaters and 7,600 screens in the US and Europe. In the 12 months ending March 31, 2016, Odeon & UCI brought in $1.2 billion. This compares with the $3.1 billion in revenue for AMC in the same period. AMC outperforms Odeon & UCI in average revenue per location and per screen. Data sources: AMC Entertainment, Odeon & UCI. Calculations by author. Odeon & UCI underperforms AMC in revenue per location, in part because the chain averages fewer screens per theater. The European business trails in revenue per screen as well. AMC still believes that this buyout of a business underperforming its own is a favorable deal. Company management thinks revenue can be increased by introducing things like reclining seats and premium food and beverage concessions, initiatives that have boosted AMC's U.S. revenue in recent years despite slow growth in ticket sales. The purchase also diversifies AMC's business, making it a multinational organization operating in the U.K., Ireland, and mainland Europe. AMC CEO Adam Aron stated that, in spite of Brexit-related uncertainties, the deal was an "opportunistic transaction." With the U.K.'s decision to leave the European Union still fresh, this move is a bold one for AMC. But I like the "buy when others are selling" mentality of the ambitious theater chain. What about small-town U.S.A. cinema operator Carmike? 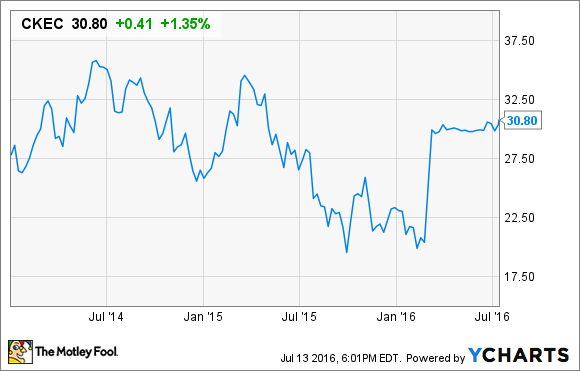 Does this announcement leave shareholders of Carmike out to dry? Or is this movie-theater love triangle actually workable? AMC management quickly maintained that the foray into Europe has no effect on the Carmike deal announced back in March, and that the company is still committed to the deal. That isn't to say, though, that the merger isn't at risk. Carmike's shareholder meeting to vote on the merger was postponed from June 30 to July 15, because some shareholders say that the $30-per-share cash offer, valued at $1.1 billion, is too low. Most notable in the conversation has been investment advisor Mittleman Brothers LLC's call to fellow Carmike shareholders to reject the offer, claiming that a fair valuation would be at least $40 per share. AMC's $30-per-share offer represented a 19.5% premium to Carmike's shares the day before the proposed announcement, but is still shy of the stock's most recent high of $35, back in August 2014. Whatever Carmike's shareholders decide on July 15, AMC has stated a price over $30 per share is unfavorable, and is fine whether the deal goes through or not. Investors interested in AMC should be sitting on their hands right now. In the days since the announced acquisition of Odeon & UCI, the stock has jumped up by double digits. With risk that the Carmike deal could fall through, and a new acquisition being digested by the marketplace, I would avoid investing on any speculation and wait for the smoke to clear before deciding on the long-term investment-worthiness of AMC. Current shareholders of AMC are no doubt quite pleased with the run-up shares have experienced so far in 2016. Despite money trading hands with an unknown combination of buyout candidates, AMC management has stated it expects to maintain its quarterly $0.20-per-share dividend. Current shareholders should also adopt a "wait and see" approach in the weeks to come. The real impetus to act now lies with Carmike shareholders. With AMC management stubbornly holding to their $30-per-share offer, this new deal with the European theater chain backs up their talk and perhaps, from their viewpoint, makes the Carmike deal expendable. Carmike shareholders will need to decide if $30 per share is acceptable, or if life post-AMC-breakup is an acceptable scenario. There is potentially a lot to lose in the short term when they vote on the deal, especially considering the $25-per-share valuation before AMC's offer arrived.